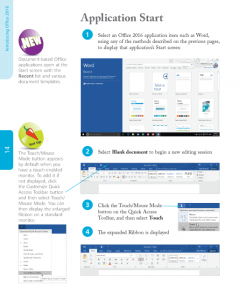 Fully demonstrates the five core Microsoft Office apps: Word, Excel, PowerPoint, Outlook, and OneNote. Introduces Access, Publisher, Sway, Visio, and Project. The easy way to get up and running with Office! View and download Table of Contents and first chapter - FREE! Office 2016 in easy steps fully demonstrates the five core Office apps - Word, Excel, PowerPoint, Outlook, and OneNote. 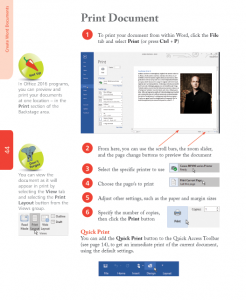 It introduces the reader to other great Office apps too - Access, Publisher, Sway, Visio, and Project. There is also coverage of OneDrive cloud storage, Office Online web apps, and Office apps for Android devices. 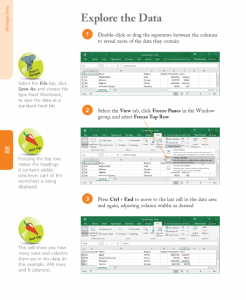 Office 2016 in easy steps works with touch, stylus, mouse or keyboard across Windows devices, including tablets. Sign in with your Microsoft ID and use the software across different platforms. 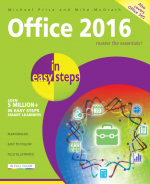 Aimed at both new and experienced users, Office 2016 in easy steps covers the essential functions of Office 2016. Packed with tips and shortcuts, this guide will help you learn fast so you can focus on the job in hand! Michael Price is an accomplished author, IT journalist and systems consultant with a wide experience of computing systems ranging from mainframes to personal computers. He's also a successful author with several best-selling In Easy Steps books to his credit, including earlier editions of Excel in easy steps.